It’s been a while since I’ve written about James David Manning, the “pastor” of the infamous Harlem hate church with the notorious hateful church sign. The church is currently in default of taxes, water, and sewage bills far in excess of a million dollars and fighting a losing battle over those fees and a bunch of zoning violations to have its building seized. 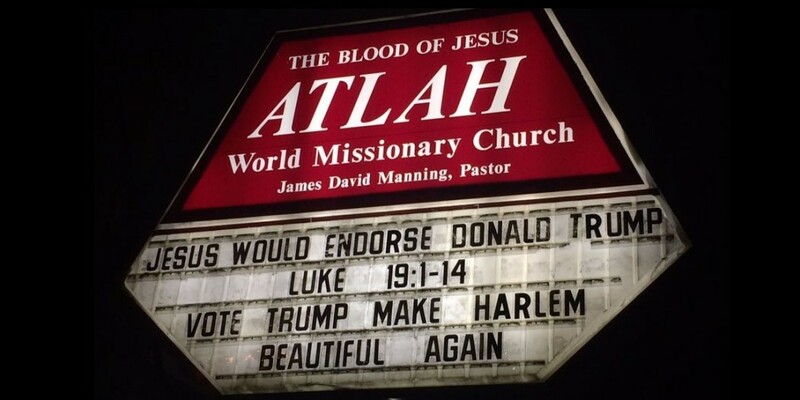 Manning made the news briefly last year when he endorsed Trump for president, and his church sign claimed that Jesus would endorse Donald, as well. A while later, he withdrew the endorsement, because Donald indicated that the murderer who perpetrated the mass shooting at the Orlando gay nightclub, Pulse, was a bad person. Can’t condemn the murders of queer people and still be a christian, now, can one? Then, he seemed to flip back to endorsing Donald when he took some of the candidate’s statements to indicate it would be legal for christians to shoot Mexicans, muslims, and liberals. It boggles my mind that someone can claim to be a follower of Jesus while spewing such hate. I mean, seriously, being overjoyed at murder? Looking forward to committing murder with impunity yourself? 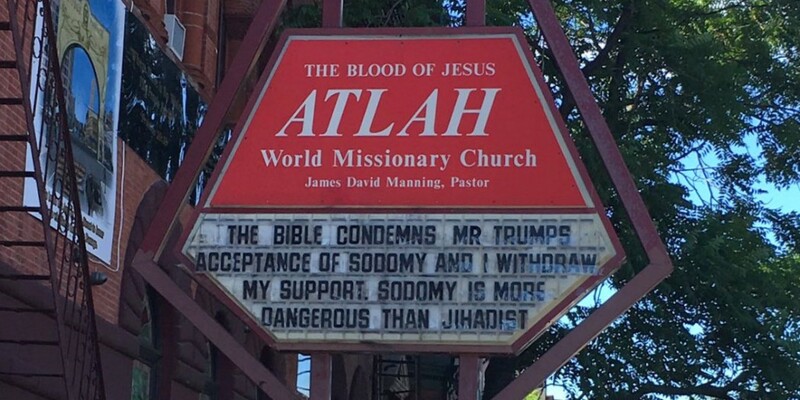 What boggles even more is that people who claim to believe in the man who said “love thy neighbor as you love thyself” will follow these hatemongers and proclaim them great faith leaders. We have people like Bryan Fischer of American Family Radio saying things like ‘The Real Brownshirts Are In The Homosexual Movement’. That’s pretty rich coming from a guy who was removed from one of this jobs at the American Family Association because his anti-semitic and anti-muslim comments raised a bit of an uproar too close to a Republican fundraising event in 2015. Then there’s Scott Lively Scott Lively: Trump Must Ban Gays From Intelligence Agencies Because They’re Conspiring Against Him. Lively is currently involved in a lawsuit for crimes against humanity (I kid you not), because he gave encouragement and material assistance to get Uganda to pass kill-the-gay laws. And that’s some of the least insane evil stuff he’s been involved in. But he’s the president of Abiding Truth Ministries, so he is, of course, hailed as a Christian leader. I’m not sure what has prompted Manning to turn on Trump again this week. There’s probably a new sermon up on his youtube channel explaining it, but I can’t deal with listening to any more of his hate and craziness. I have to admit that I kind of like the nickname “Tribulation Trump” for Donald. But I’m sure that Manning will flip-flop back to loving Donald again, he just needs to do something hateful enough that Manning recognizes him as a fellow devil, again. There are even more poorly disguised devils in the news, of course. Yesterday a lot of people, particularly right-leaning news and blogging folks, were being shocked, shocked to learn that Milo Yiannopoulos has argued in favor of adults having sexual relationship with underage teen-agers. He has specifically insisted that this is not only good, but tried to claim that it is normal in the homosexual community. All of which is BS, but really shouldn’t be a shock to anyone. It’s not as if he hasn’t said this sort of thing many times before. Nor is it at all inconsistent with his other attitudes. So let’s unpack that a little. In the past, Milo has espoused a lot of undeniably racist opinions. He has orchestrated harassment campaigns against women, particularly women of color. He has encouraged violence against trans people. He has excused actual calls for genocide from some of his neo-nazi friends. He has advocated so-called “peaceful ethnic cleansing.” He has previously made sexual references to teen age boys. But it is only when he has specifically advocated for adult men having sexual relationships with 13-year-old boys that the Republican party, the organizers of the Conservative Political Action Conference, his fellow writers & editors at Breitbart, Bill Maher, and Simon & Schuster are objecting? In other words, all of those people and institutions are okay with racism, misogyny, transphobia, hate crimes, and genocide. Let me repeat that: the Republican party, conservatives who organize CPAC, Breitbart writers & editors, Bill Maher, and the publishing house of Simon & Schuster don’t just turn a blind eye, they happily endorsed racism, misogyny, transphobia, hate crimes, and genocide. When people show you who they are you should believe them. Also, it seems a lot of people are easily fooled by someone who says outrageous things when those outrageous things are attacks on people they dislike.